Hope everybody is doing just fine. I gave birth to my first son last May, he is now 10 months old as of yesterday! I didnt have much time in my hand. Heck. I dont even have time to check my whatsapp. The last 10 months has been a blessed really. My son was born 2.49kg in Sime Darby Medical Centre. Conducted by our precious obgyn Datuk Dr Siti Zaliha Zainal. All covered by Bank Negara. Well, not all of it but I must say, being a medical doctor does help though since I was not being charged with consultation fees up to my delivery dates. Apparently it is unethical to charge consultation fees to fellow medical colleagues, which I think was pretty uplifting. Allocated money for delivery was around RM4k but it boils down to only RM200++ in the end. Saved up good money for baby stuffs. The little guy is growing really fast. I didnt keep track of all the milestones into a book and what not. I didnt want to put that kind of pressure at early age I guess. But currently at 10 months, he cruises around, trying to stand at his own feet, always smiling, get mad when people tell him not to do or take stuffs. LOL. The joy of motherhood. Im like 5kg heavier, chubbier, and 10 million times more happier. Kekekeke. These are just some pictures I have in this laptop to share. Day 2 of life. I didnt swaddle him like usual babies, so he was all over. This was the next day after delivery. I could vividly remember how the sun shone through my hospital room window on his little face. Priceless. This was maybe around 4weeks, when we got him his first vaccination. Stylo tak? mommy and Aziq at 2 months old. I think thats all for now. I got more pictures but mebbe in my future posts. Hello folks it has been a LONG time since my last update. I was concentrating on my career and wasn't up for any jibbery entries. Hold that thought for a while. I have actually lost all data pertaining to my experiences in the subsequent department, I guess too much work have been occupying my time and the only time I have to rest is well spent to counter the amount of work we had to do. Nope. Not complaining at all. As for updates. A LOT of updates. I got married last year to a lovely guy in July. Gone on our honeymoon had spent like a lot of time together. So pleased how my life turned out to, Alhamdulillah.. And more good news, I am currently pregnant @ 34-35wks!So far so good, my baby is currently around 2kg. Gained around 10kg since pregnancy. I recently finished my housemanship and currently I am waiting for myself to be posted somewhere. But I guess I just worry about delivery rather than my career for now. 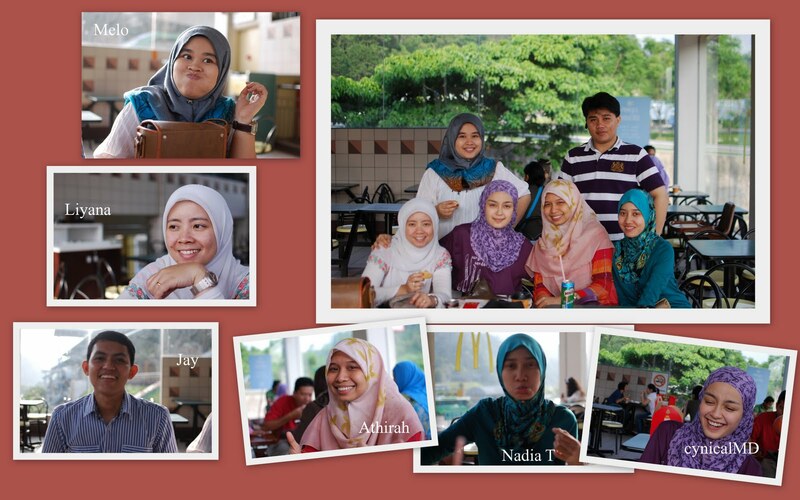 In between the time I met new colleagues, new friends but still close with my old friends and colleagues. I watched all my medical officers becoming specialists, specialists becoming consultants..These are the people that have aspired my years in medical world. I am still here. Still deciding what to do next in life. Hope I dont take too long to decide. 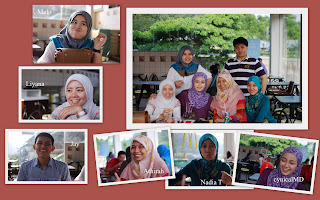 Miss this blog. Read the previous entries,reminded me so much of the past. My life is colorful. Im so glad of all the things that happened and that have not happened. The reasons behind them are vague but turned out one by one reveals to be very encouraging. For now I really like to write more about medical issues. I love stalking for women. I shall do that now. My maternity leaves starts soon. Wish me luck for my labor. Please feel free to browse through my attempted website for women out there: Healthy Women AwarenessI have made it as simple as possible for people to understand. but we must keep on stepping. Hows everybody doin ey? Had a good weekend? Anyone went to the BERSIH gath? 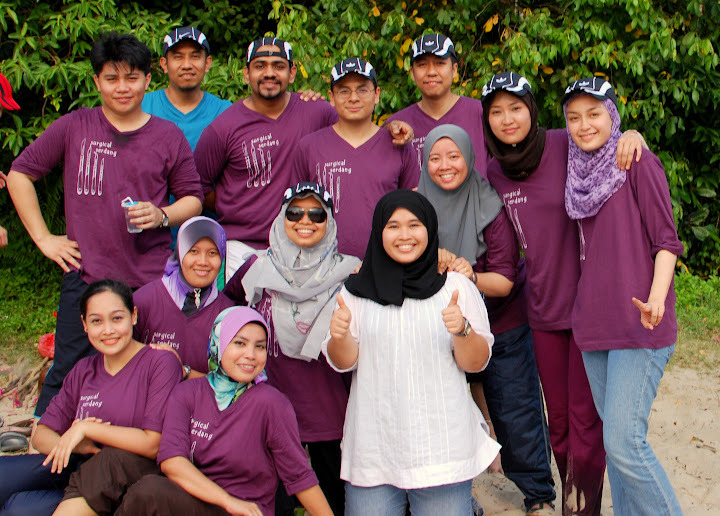 Surgical department just had an awesome family day in Cherating last week. A snap before the road-trip. Holiday mood. Mereka2 yang jakun ye kawan2..
Athirah & me with Dr Ho and his Evelyn! Im good thanks for asking. I will answer the formspring questions later when I got time. Life has been good. I just got back from Tawau recently and it was great seeing how houseman work over there. Seafood is well cheap. Great people, nice town la. I want to go there again someday after getting my diving license which is like..err..when? Ok finela I have to collect money firstla. LOL. Sipadan is nearbyla but you need to book to go there 3 months in advanced for the scuba-diving. We went to Mabul Island which is like so breathtaking. They have their wooden houses on water wei. My god they have no idea how lucky they are there. You see normal kids kickin football and playing bicycle. Over there these kids swim and boat race wei! Best gile. I used to be so jakun during flood period bila balik kampung, Im sure I would be a very happy child if I grew up in Mabul. LOL. Their Klinik Kesihatan also not bad la. The clinic is just near the sea la. KK Semporna they call it. I wouldnt mind getting posted there.OK. I do mind a bit la since I might get pretty homesick. But then again as my hosp director would say la, all HO from our hosp confirm dapat sabah/sarawak as MO. So just wishful thinking la its not somewhere like Kapit or what not. I mean leisurely I wouldnt mindla taking the boat to the clinic but daily basis wise I think I might die wei. LOL. ORRRR I could opt for radiology la and stay in Semenanjung. AND on top of that I would have like 2 weeks more leave as well! It's called the Radiation Leave. Cool innit? My Cardio MO once asked me "So Alina, what are you gonna do after this?" and I replied "Hmm..I want to be a cardiologist la" and my MO laughed out loud LOL. She went "Ok dear, I was like you also before, wanting to be a cardiologist, on top of the field yada yada, but when I got married, things change. Cardiology is ok for guys la I think"
And I went like "So what's your choice now then?" " err...maybe Radiology or or Dermatology" she said. We laughed. Okla I need to study. There are a lot of 'JOURNALS' that I need to read. (Buku medschool pun x habis baca nk bace journals LOL). If you want to be successful, you must keep yourself busy. If you want to be resourceful, you must become a busybody. ive been very busy lately taking care of the acute cubicle. MRSA la, Leukemia la, DKA la..haha.tapi layan! menarik! yg tak best ABG marathon la. tukar setting sket kene amik ABG. haih. dh brapa kali aku lari ke lab nk trace ABG takut clot! PPK mcm chipsmore je..dr aku tunggu PPK baik aku yg anta, satgi kalau boss tanye2 kang aku yg kene padahal punyela berusaha gile amik ABG. depending on patients la..ya Allah ada yg pulse volume x elok sgt susah betul nk amik. tskkkkk..
oh btw layman term, 'acute' meaning as in critically ill ones, most on oxygen supply and tracheal mask and what not. trying to grasp every detail about each patient i take care of. tried memorizing their stories and their blood results. i guess it takes time to be able to be like my MOs, they remember the whole ward's cases. crazy.
" boss how the heck u remember all the cases in the whole entire ward?" and i asked him "wut?" 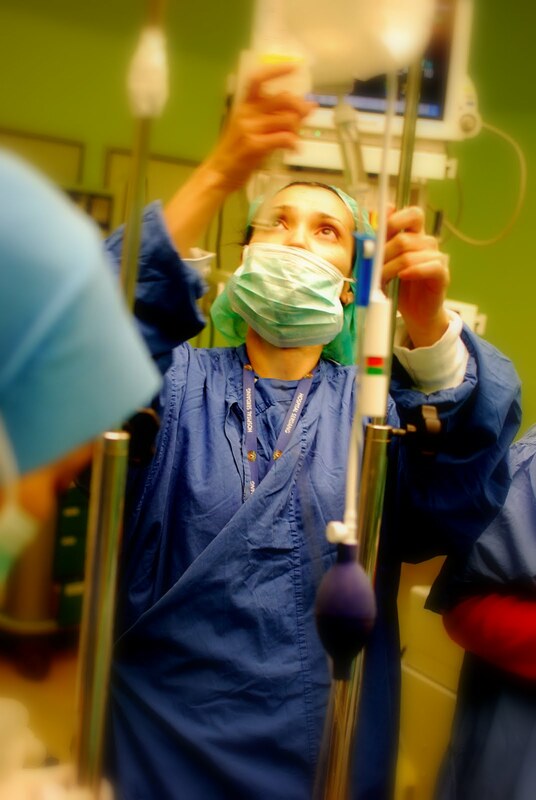 "well you tend to remember your patient when you try to link them with what you know and how they are presented. its like seeing your patients with mind maps linking all that details from first presentation of their symptoms to how they have been managed and their progress!" no wonder i cant remember all my patients. i never really linked them in my head. i used to be so pissed off when the specialist said we dont know our patient. most of the time i rolled my eyes and look at the floor. i felt so menyampah-gile-mcm-la-ko-sorg-je-yg-bagus-dlm-dunia-ni LOL. ala biasalah orang muda mestilah emosi bila kena hampuk kan? huhu but then as menyampah as i felt, deep down i know that ..yeahh, i should know my patients inside out! my brain is not gonna turn into a computer unless i force them to. no choice! so currently im trying my best to upgrade my RAM la. though i dont think 1 weekend per month off is enough time for that to take place. lol . byk pulak complain kan dah dpt weekend off tu senyap jela. haha. ala to be honest I normally start to shut down my brain when I work non stop for like 3-4 weeks, no rest, no day off. lol. lame lagi ke nk jadi specialist leh tido kat rumah angkat tepon jawab soklan bagi orders je huhu. berusaha! chaiyok2! okla. dr aku blog kt sini tah pape baik aku pegi upgrade RAM otak aku dgn tidur yg cukup huhu. Recently posted to Cardiology. Shocked in awe. Everything hits me. ECGs! During my medschool, reading ECG is almost the same as passing out urine. It come and it goes. LOL. Oh god you have no idea what I've been doing during my medschool. Or what I've not been doing.LOL. Friggin interesting cases. Ive now encountered real Atrial Flutters and Atrial Fibrilations in hemodinamically unstable patients. There's shock here and there. CPR non stop. We eat ECGs and drink CPR basically. OK not tht I'm good in ECG now but BETTER than before. You guys over there have no idea how important it is to know ECGs, esp in emergency cases where you need to shock these patients. Haih. Couldnt emphasize more. I need to work tommorow. Everyday must work you know..Haih..No weekend off. If I collapse then just leave me. I give consent DIL NAR to myself. Jk. Good money? yeah maybe but no rest. So sincerity is the key to become a doctor. Trust me I got pissed off knowing the 'oncall' McD staffs got paid more than us,but please, be sincere in our work. Ok. Ciao. Bace VT,bile nak cardiovert,bile nk shock..baik korg bace skrg. I love medicine, fashion, reading,writing,football and sushi. A nerdy junior doctor in Malaysia. Enjoy. Keep coming back! Stay healthy! !